One of my favorite pieces for Fall, let's even say for all seasons, are my black leggings. Do you know when you are not in the mood to dress up and you can't get yourself inspired?! On those types of days, my black leggings always come to my rescue. So easy to pair and ultra comfortable, leggings go with pretty much everything and anything. Uma da minhas peças favoritas para o Outono e a minha calça legging preta. Sabe aquele dia que você está sem inspiração e ate mesmo sem paciência para se vestir?! Pois então, a calça preta sempre vem para o resgate. Fácil de combinar e ultra confortável, ela combina com tudo. Vai bem com camiseta, blusa ou pulôver. My pairing choice this time was my red sweater style shirt from Zara. 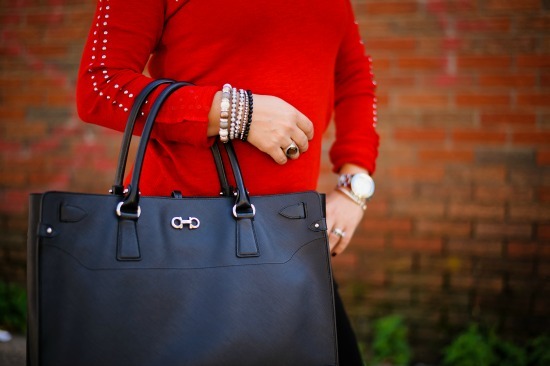 I just love the details of the studs on the sleeves and the red color is just fantastic. Since I wanted to look a little more dressed up I wore this combination with my Michael Kors Slingback, but you can easily pair this type of outfit with flats or boots. Dessa vez eu coloquei com uma camiseta vermelha estilo moletom da Zara Eu adorei os detalhes de tachinas na maga e a cor vermelha é maravilhosa. Como eu queria um ar mais fashion do que casual, eu usei minha sandália de salto alto preta da Michael Kors que nunca falha. Mais você pode fácilmente colocar uma sapatilha ou uma bota que vai muito bem. I hope everyone is having a good day so far, since Hurricane Sandy just arrived in the Nations Capital. Be safe and Happy Monday! Qual é a sua peça de resgate? Bom Dia e espero que todos estejam tendo um dia maravilhoso. Esas tuas bolsas me deixam LOUCA ANA! que lindaaa essa tb!!!! aliás, adorei o look todo! tá mto chic e elegante! I wore my black leggings for the exact same reasons all weekend:). That red top really spices things up, love it all! ANAAAAAAAAAA, (sou a sobrinha da Dani, falandodefeminices.com), não sei se vai lembrar de mim. Nossa, parabéns, seu blog é MARAVILHOSO, amei muito. É claro que estou te seguindo. Claro que eu lembro sim!!! Pode deixar que eu passo la no blog!! love the shape and size of your bag! Thank you so much Caitie!! you look fab! I love your sweater so much! 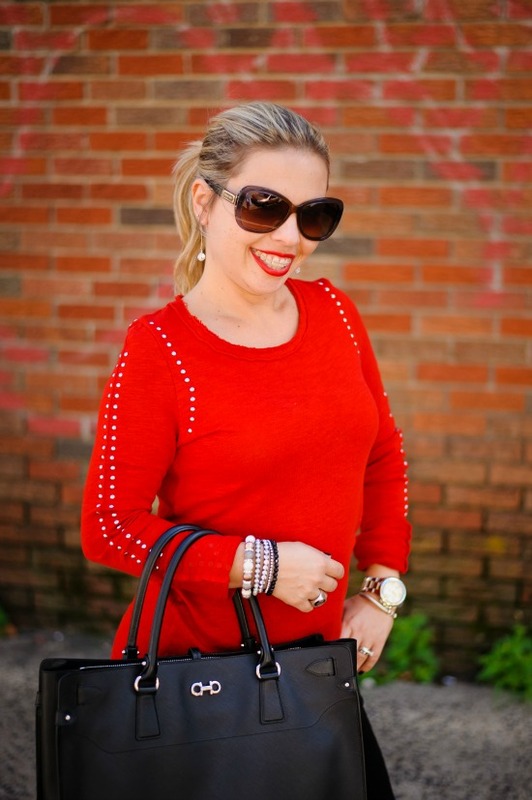 I love this red top on you! You look so pretty! Red suits you Ana and I am so in love with your fabulous bag collection! Especially this one and your recent tory burch one too. Great blog and amazing style. Now following! Cute look! Loving your sweater! The sleeve detail is great!